At long last, I am pleased to announce the forthcoming publication of nine new essays in the Lexiculture Project, my collection of undergraduate research papers on the history and cultural complexities of individual English words. These constitute the contributions to the project from the 2014 (!!) edition of the course, long delayed to to editorial sloth, and will constitute Volume 2 of the series, with Volume 3 to follow in the summer. Rather than publish these all at once, I’ll be publishing them one at a time, every Wednesday for the next nine weeks, clearly indicated with authorship, and including a link to the PDF version of the article for download as well as the HTML version. When they’re all published, all of the links will be permanently archived in the Lexiculture section of the site. Thanks to my students for their forbearance throughout this process. I’m not quite sure whether a blog that has been in existence for six years can qualify as having a ‘retro’ period. But I spit on fascist definitions of retro! Those of you who follow me on Twitter (@schrisomalis) may see, over the next couple of months, some tweets to old Glossographia posts (at least a couple years old) that didn’t get (in my not-so-humble view) enough attention when I wrote them. I’ll note the year in the new tweet. If you don’t follow me on Twitter / don’t care about Twitter / regard Twitter as the spawn of some ineffable entity, then you won’t notice anything. As you will see (at least, if you view the site on the WordPress page as opposed to on an aggregator or somewhere else), I have changed the theme and layout for the site. Hope you like it – any theme is going to have its advantages and disadvantages. Frankly I was getting annoyed at the small text size and plainness of the old theme, which had been around since the blog’s inception in 2008. This one has larger text and is more modern, and the main headings are larger and clearer (now at the left sidebar). Comments and criticisms are welcome, bearing in mind that this is a free WordPress site so my options are somewhat limited. Well, here we are again at the first day of classes (for me) at Wayne State. This year my Language and Culture undergraduate class will be following and reading my blog posts here as part of our in-class discussions, and material from here will also end up on their final take-home exam. So we may see comments and questions here from some newcomers from my undergrad class, who have no prior background in anthropology, linguistics, or both, and any of your comments and questions may show up as discussion fodder in my classroom. Your kindness in the spirit of pedagogy is appreciated – thanks in advance. It’s also the first week for a lot of new graduate students, both here at Wayne State and across the country, in all sorts of fields. So, in the interest of spreading the word, here’s a great article, ‘The Ten Commandments of Graduate School‘, that deserves a careful read not only by students, but their mentors as well. For those of you who may not know, I run a sister site to this blog, The Phrontistery, which in one form or another has been around since 1996, and which features an online dictionary of rare words, glossaries on various topics, and other language-related resources. While the site has been more or less dormant for a few years – mostly I’ve just been keeping the place tidy without adding any new content, I’ve had a slow(ish) summer and so took the opportunity to get things up and running smoothly there again, with a bunch of new content and a new site layout. Over the years I’ve given a lot of thought to somehow combining the two sites, e.g., by moving Glossographia over there or something, but I’ve never had the energy to figure out how difficult that would be. Let me know if you think that would be a terrible (or great) idea, in which case I don’t have to think about it any more. Yesterday, my post, Cistercian number magic of the Boy Scouts, was the 200th post on Glossographia since its inception. Today, around 8:45pm EDT (roughly 15 minutes ago as I write), some lucky visitor to the site rolled over the odometer, marking 100,000 views of the site all-time. 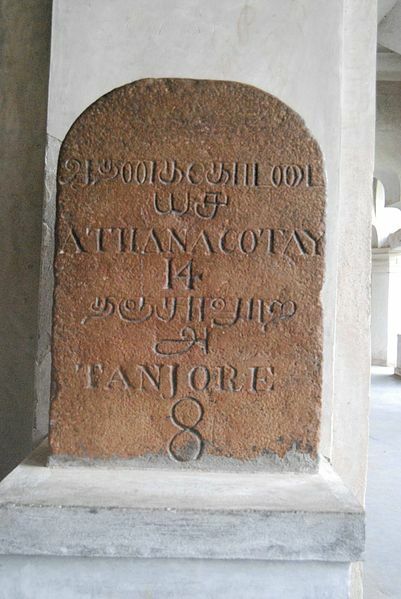 In honour of these milestones, here is a an actual milestone, from Thanjavur (Tanjore), Tamil Nadu, India, which features the numerals ’14’ and ‘8’ in both Tamil and Western numerals.